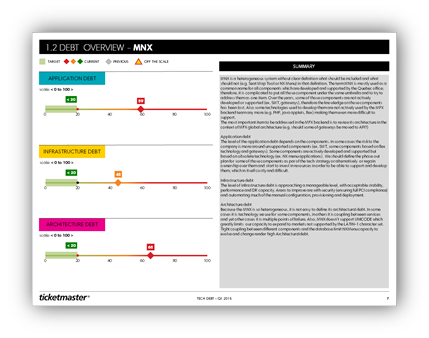 This post describes the journey Ticketmaster has been on over the last year to define and measure technical debt in its software platforms. 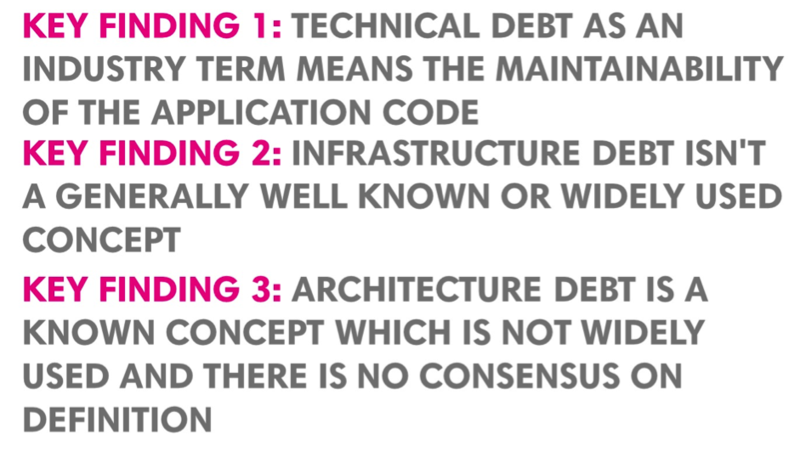 The issue kept surfacing from multiple sources, and yet as an engineering organisation we had no consensus on how to define technical debt, yet alone measure it or manage it. So we embarked on a journey to answer these questions, and gain agreement across the engineering organisations in order to effectively provide a common approach to solving the problem. 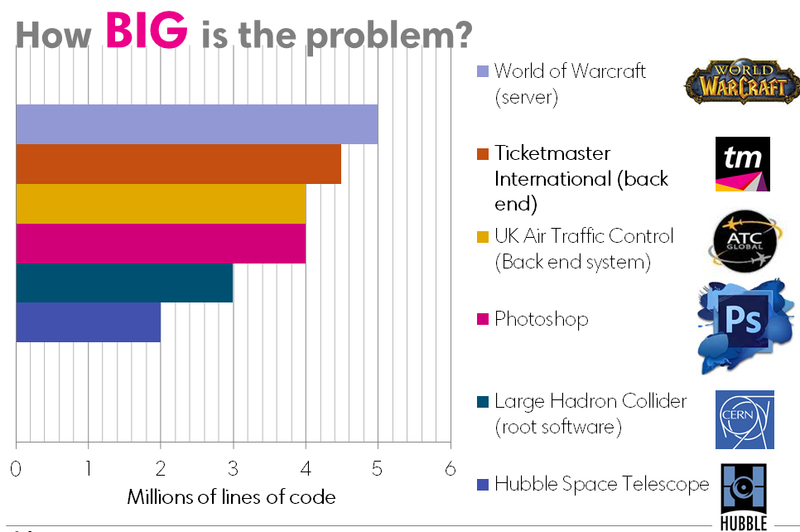 A chilling example is of Knight Capital who ran updates on their systems that reactivated some dead code, causing the system to spit out incorrect trades – losing $460 million in under an hour (Source). 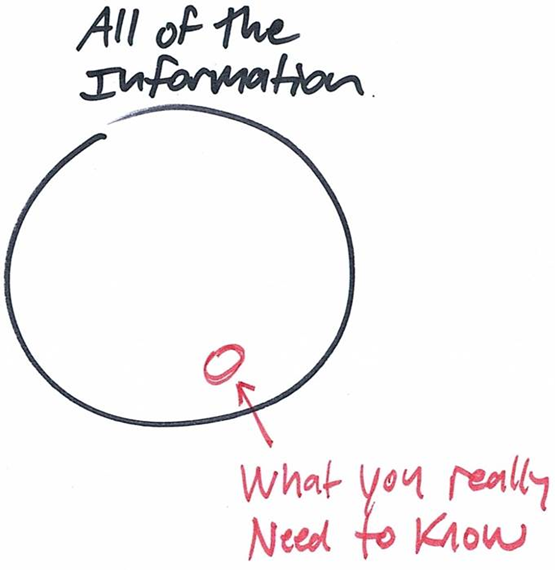 At this point, we’re left with lots of data. One of the core driving philosophies behind the whole process was to present pertinent information to enable executive level decisions to be made as to how to manage debt from a strategic point of view. Part A (above) contains a rolled up score for each of the three main debt categories for each of the systems being reported on. 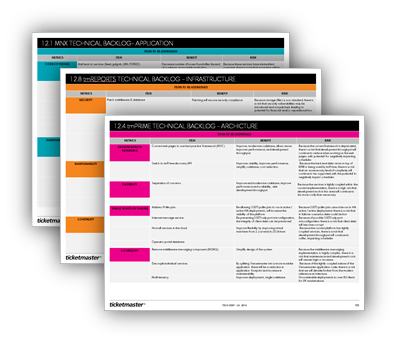 It also contains a summary of the debt in the platform which have been contributed by the Engineering, Tech-ops and Architecture groups. 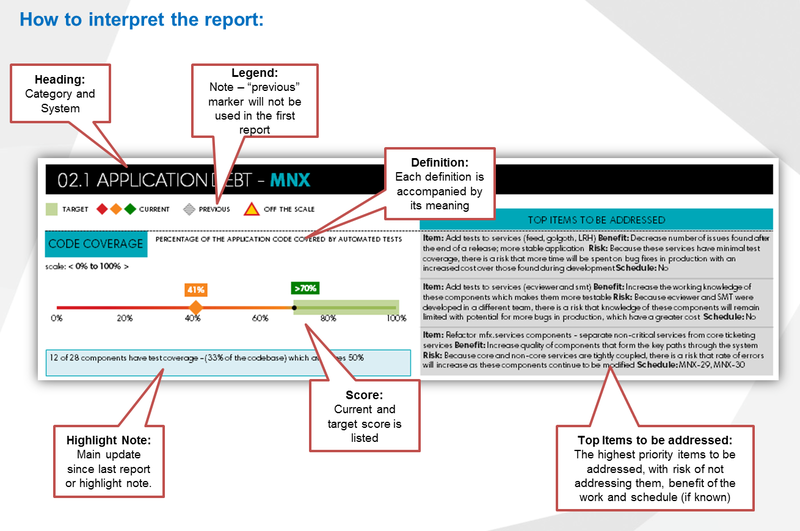 Part B (above) contains a more detailed breakdown of each main category’s definitions for each of the systems being reported on. This gives the reader a better insight into which definitions have higher or lower debt levels and an indication where work needs prioritising. It also shows the next items to be worked on. 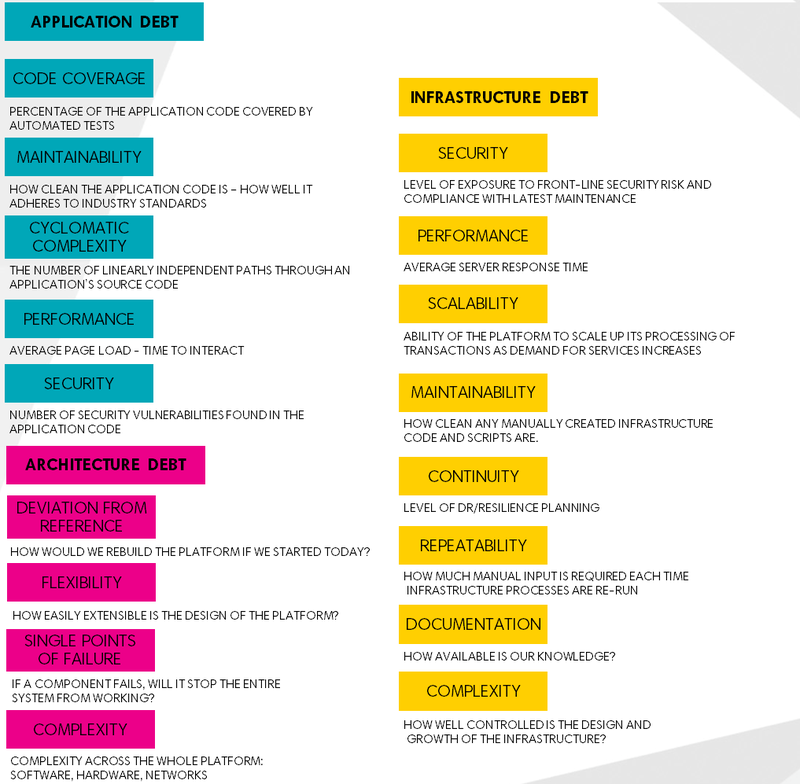 Part C (above) contains the longer term technical debt backlog of for each of the systems being reported on, broken down by category. There is no indication of time for each item but some could span months or even years. This section is aimed more towards the Engineering and Architecture teams. What do we do with the output? Value needs to be clearly defined and communicated, in order to make the right strategic decisions for scheduling the maintenance work and managing the debt. 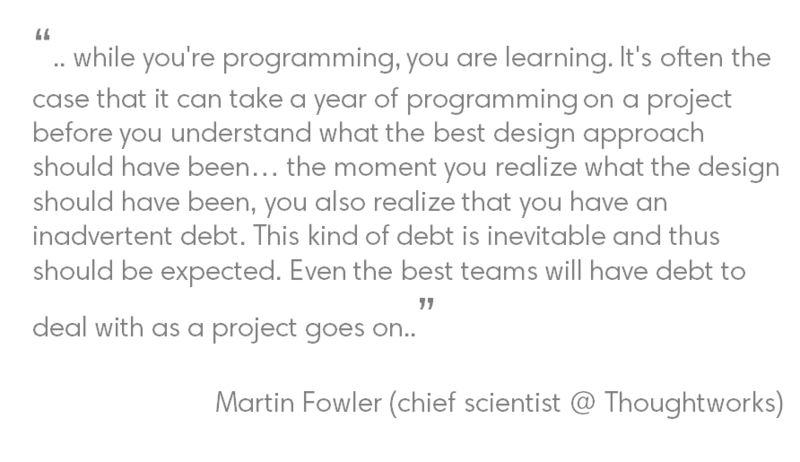 Management of technical debt is more than just about identifying and scheduling maintenance work. 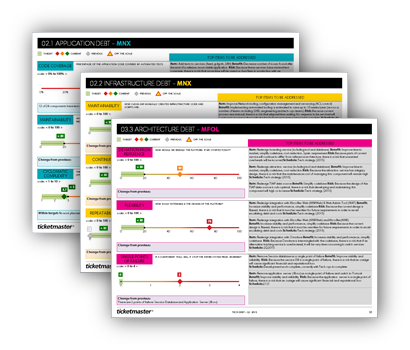 With the plan to issue the report quarterly, the intention is also that the visibility the report provides, plus the tooling provided to engineering teams will help to stem and reduce the introduction of technical debt. 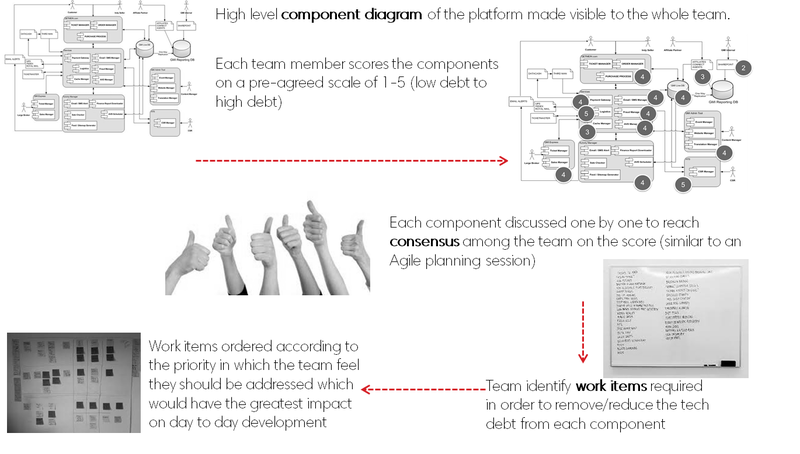 By adhering to industry best practices, and being conscious of the implications of introducing further debt, engineering teams can take steps to build quality into the products and platforms as they go. The debt that is introduced as projects progress can therefore be minimised, and product and engineering teams can make more informed decisions about how and when to pay debt down. Ultimately the goal of each of us is to delight our fans. Running well maintained systems will benefit them with better stability, better response times and ultimately faster delivery of features as debt is brought under control, managed and interest rates reduced to a sensible level. Debt management will benefit the whole business in a similar way – less firefighting, fewer outages and platforms that are easier to develop. Ultimately, we all stand to gain. Do you ever use the strangler application as an approach to pay down application debt. Hi Steve, yes, we do use the strangler pattern. One example is for the front end of our International platform (e.g. 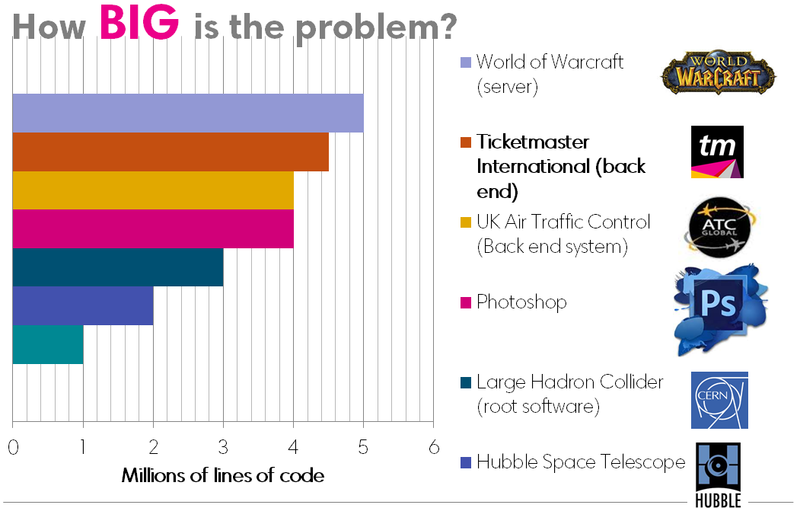 http://www.ticketmaster.de ) The team have been gradually whittling away at a multitude of legacy CSS, selectively isolating and then replacing their functionality. This is an ongoing process, as the pattern suggests, and we’re now at a point that we’ve almost removed all of it. Oops. There was an extra bar. Fixed now.